I’ve been a member of the same church for over 20 years. This year is the first time I’ve ever served on the Worship Board. Gosh, “saying” that out loud sounds bad, but I was the Bookkeeper for about 15 years (which is much more in my comfort zone!). Each year during the season of Lent, I try to attend the special weekly programming that starts with Ash Wednesday and usually ends with Maundy Thursday, always yearning to feel more of a connection to God. This year was no different. Except it was. It was different because in addition to Maundy Thursday, we added time for personal reflection on Good Friday, and an Easter Vigil Saturday night. There was a lot of planning to do. A lot of logistics to think about. A lot of setup and cleanup and rehearsals to attend. A lot of busyness. It was more than busy, it was somewhat overwhelming! It was different because we served communion three times in four days. It was different because I was actively involved. It was different because on Maundy Thursday, we had a foot washing ceremony. And at the end of our worship Service, as we’ve sometimes done in the past, we stripped the altar. In the busyness of rehearsals, I was really just focused on remembering what to do and getting it right. And here I was on Maundy Thursday, doing the exact same things that I did in rehearsal. Only I wasn’t. This time was different. What happened that night was intentional and reverent and sorrowful. And powerful. By the time I left the sanctuary, tears were welling up in my eyes, and I couldn’t stop them. I took a seat in the narthex next to my pastor and looked back at the naked altar. It was different. I was different. Even though I’ve heard the story of the foot washing, last supper, and crucifixion of Jesus many times, this time I felt it. Jesus died on that cross for ME (and for you!). And in that moment I felt the enormity of God’s love and grace. I felt a huge weight being lifted from my shoulders. All the hurts that I’ve caused, and all the hurts that I’ve carried, were suddenly gone. God loves me for who I am right here, right now. And God loves you just the same! Sometimes in the busyness of our lives, we forget to listen for our “still speaking” God. And sometimes, when we least expect it, God sneaks up on us. Were you there when they crucified my Lord? Yes. Yes, I was there. And I will never be the same again. 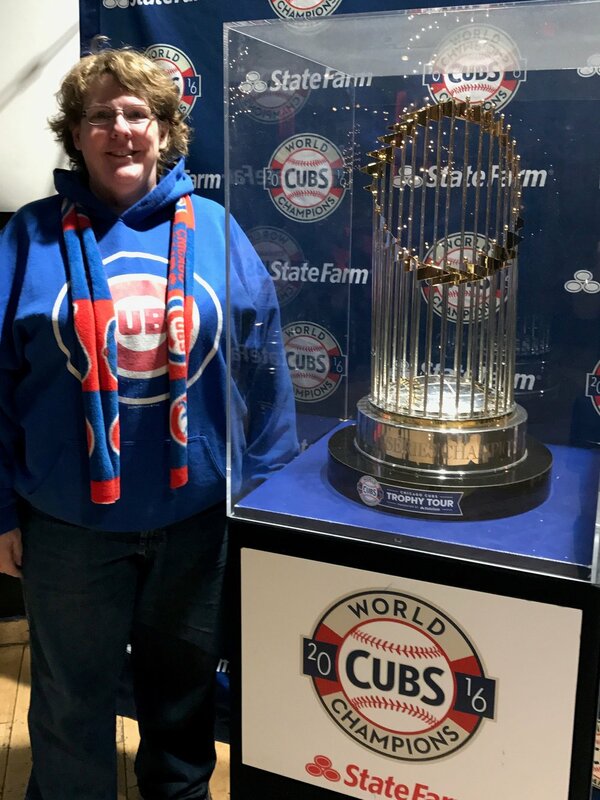 Cathy Loughead is an accountant by day and and avid Cubs fan in her spare time. She lives in Davenport, Iowa and has two daughters and two granddaughters who are the joy of her life.